Chinese authorities appear to be blocking access to a state-funded website which recalls the evil of the Berlin Wall, organizers of the culture project in the German capital said Thursday. The operating company, Berlin GmbH, said the website had been unreachable for Chinese users since Monday, after Chinese Twitter users had posted messages protesting about web censorship in China. It said the cut-off had been confirmed by several sources. China has blocked a website inviting users of microblogging site Twitter to comment on the fall of the Berlin Wall amid a deluge of protests at Beijing’s Internet censorship, organisers said Thursday. 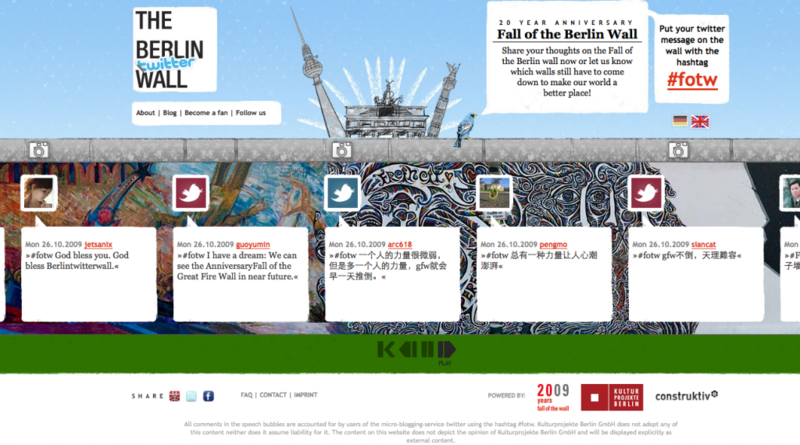 Of the roughly 3,300 comments left on the virtual wall, around 1,500 have been in Chinese, said Carsten Hein, coordinator of the “berlintwitterwall.com” project. Read also on CDT: “Mr. Hu Jintao, Tear Down the Great Firewall!” (Updated with Video).